3Department of Chemistry, Sciences and Research Branch, Islamic Azad University, Tehran, Iran. 4Department of Chemistry, Payame Noor University, PO BOX 19395-4697 Tehran, Iran. A simple and biological method for the fabrication of palladium nanoparticles (Pd NPs) was developed, applying the non-toxic and sustainable natural extract from Artemisia abrotanum as the reducing, stabilizing and capping agent. 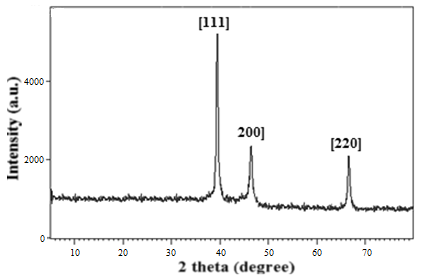 UV-vis spectroscopy, X-ray diffraction (XRD), Fourier transformed infrared spectroscopy (FT-IR), field emission scanning electron microscopy (FE-SEM), transmission electron microscopy (TEM) and energy dispersive X-ray spectroscopy (EDS), were utilized to classify the synthesized Pd NPs@Artemisia catalyst. The Pd NPs@Artemisia demonstrated excellent behavior as a reusable nanocatalyst in Suzuki-Miyaura cross-coupling reactions at room temperature. 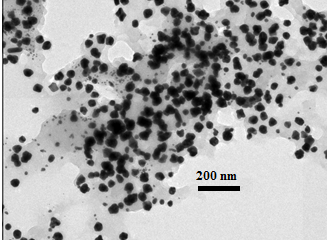 The nanocatalyst was recycled 7 times without any significant deduction in catalytic activity. The manufacture of metal nanoparticles with the assistance of plant extract is an auspicious substitute to past chemical procedures [1-5]. NPs have generally been procured through various chemical and physical methods based on their accessibility and feasibility [6,7]. A large proportion of these processes, however, have implemented the use of expensive equipment or dangerous materials that have a high likelihood of leading to harmful environmental and social implications . The usefulness of certain NPs can be inhibited due to residual waste from the toxic chemicals adsorbing their surfaces . In this sense it amplifies the necessity of developing green and renewable methods for the synthesis of NPs. [11-14]. Due to their cost-effectiveness and abundance, plant extracts have attracted attention in the commercial biosynthesis of NPs [15-17]. Au, Ag, Pd, Pt, Cu, Ag/Au, Au/Pd, and Cu/Au are among the many metallic and bimetallic NPs that have been successfully procured via various forms of plant extracts and have potential usefulness in fields like optoelectronics, SERS based detection of tiny molecule analytes, biological labeling, and catalysis [18-25]. 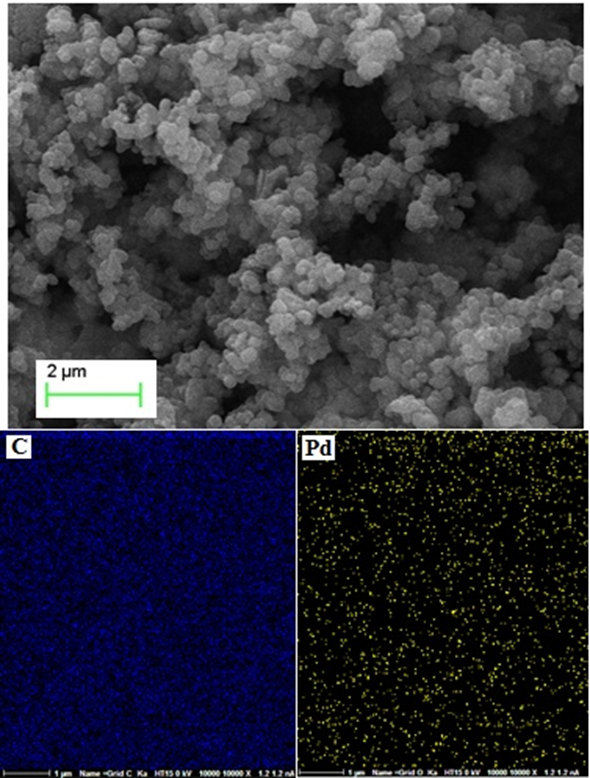 Of the successful metallic NPs, Palladium can be useful in sectors which employ homogeneous and heterogeneous catalysts [26-28].Some of the reactions having been examined as they use Pd NPs include hydrogenation, oxidation, C-C coupling and electrochemical reactions [29-32]. For the Suzuki cross coupling reactions, stable colloidal Pd NPs, namely those supported by either conventional or non-conventional supports, have been utilized as catalysts [33-35]. The Pd NPs were largely synthesized with chemical, electrochemical or Sonochemical processes through the use of dendrimers, polymers, or metal-organic frameworks as stabilizers [36-38]. Throughout the analysis, the plant extract used for the manufacture of the palladium nanoparticles was derived from A. abrotanum herb. 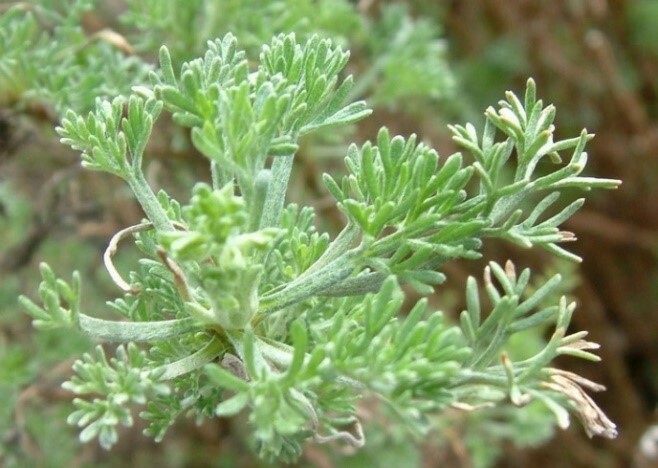 The genus of Artemisia (Artemisia L.) comprises subshrubs, perennials, plants located largely in the Holarctic ecozone, on the steppe, on the desert and in semi-arid regions of Eurasia, Central America and North America. It is one of the most abundant genera of the Asteraceaefamily. A. abrotanum L. has been traditionally used in medicine for the treatment of certain disorders, such as upper airway diseases . The vast quantity of polyphenols, in conjunction with an initial distribution of polyphenols, flavonoids (aglycones and glycosylates) and hydroxycinnamic derivatives that are contained within A. abrotanum L., refers to the fact that a variety of applications could potentially employ this herbal extract. Academia has yet to detail the procurement of palladium NPs using A. abrotanum herb extract and, as such, the goal of this analysis is mainly to gather and classify Pd NPs from aqueous extracts of A. abrotanum that act as reducing and stabilizing agents as well as investigating their catalytic behavior in Suzuki couple reactions. Figure1. Image of the Artemisia abrotanum. 10 g of dried Artemisia abrotanumwas powdered and heated alongside 100 mL of sterile distilled water at 80οC for 30 minutes, then it was cooled down to room temperature. The aqueous extract was centrifuged at 4000 rpm, supernatant separated through filtration, and ultimately stored in the refrigerator at 4 οC in order to be used as a reducing and stabilizing agent in subsequent analysis. 10 mL of the A. abrotanumextract was added dropwise to 100 mL of 1 mM aqueous Na2PdCl4 solution and refluxed at 100 οC for 2 hours. Eventually, the mixture turned black due to the excitation of surface plasmon resonance indicating that Pd NPs had been produced and also referring to the fact that hydrogen donation behavior of antioxidant phenoloics occurred within the plant. The obtained solid product was washed twice with deionized water and dried at 100 οC for 24 hours. The final dried powder was kept in appropriately branded containers and stored for further study. The Pd loading of the synthesized catalyst was measured to be 1.6 mmol/g by ICP. A mixture of aryl halide (1.0 mmol), phenylboronic acid (1.1 mmol, 0.133 g), K2CO3 (2 mmol, 0.276 g), and 6.0 mg of PdNPs@Artemisiananocatalyst (0.1 mol%) was added to 4 mL of water/ethanol (1:1) solution in a 10 mL balloon and then mixed for the desired timeat room temperature. Thin layer chromatography (TLC, n-hexane/acetone; 4:1) was used to progress the reaction. After the reaction had been terminated, 5 mL of ethanol was added and the catalyst was separated through centrifugation. Column chromatography was utilized for supplementary purification. When the Artemisia abrotanum extract addition to the Pd2+ solution was over, there was a slow color transformation from light to bright brown. This gradual shift which was a result of the excitations of surface plasmon vibrations signaled the forming of Pd NPs. Moreover, it was also confirmed via UV-vis analysis (Fig. 2). The loss of the 430 nm peak marks an absence of the Pd2+ ions in the reaction mixture . The Pd NPs were, then, separated via centrifugation for subsequent testing. We estimate that the existence of phenolic and triterpenoidic compounds within the plant’s biological matrix play the role of reducing agents for the reduction of Pd2+ to Pd0, and that the sugar compounds, like starch, present in the biomass could behave as stabilizer agents . Figure 2. 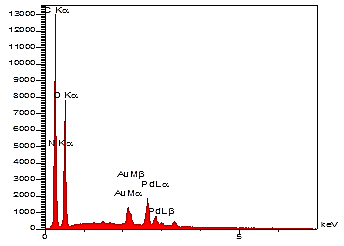 UV-Vis spectra of a) Artemisia abrotanum extract, b) Na2PdCl4, andc) PdNPs@Artemisia. FTIR measurement of PdNPs@Artemisia was conducted to identify the functional groups of the Artemisia abrotanumextract responsible for the reduction and stabilization of Pd NPs. The spectrum showed intense bands at 3345, 2932, 1657, 1618, 1518, 1456, 1367, 1247, 1076, 1033, 833, 769 and 590 cm-1 (Fig. 4). The medium intense bands at 1657 cm-1and 1518 cm-1 show the presence of C=C stretching vibrations of aromatic ring and carbon chain, respectively . The bands centered at 1456 cm-1were associated with C-O-H in plane bend of hydroxyl group of Artemisia abrotanumextract , and the bands at 1367 cm-1 and 1247 cm-1 were attributed to C-O stretching of the acid group and C-O stretching in polyols, respectively . Besides, the bending at 1033 cm-1 was associated with the C-O-C . The strong and weak bands at 3365 cm-1 and 833 cm-1were respectively assigned to O-H out of plane bending mode of the phenolic group. The band at 769 cm-1was observed to be related to the C-H out plane bend of phenyl group . On the basis of IR data, it could be suggested that the phenolic hydroxyl groups of flavonoids, present in the extract, are responsible for the reduction of the palladium ions. Figure 3. 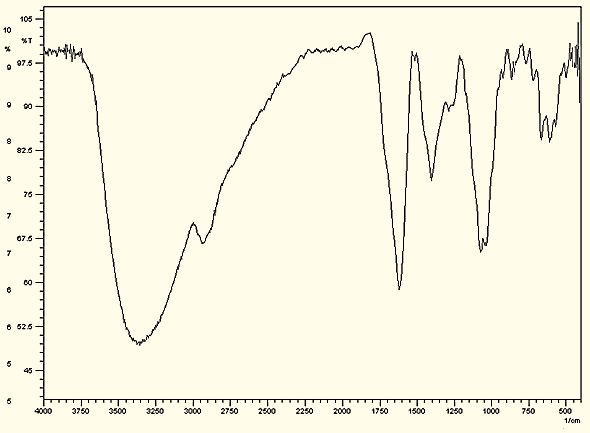 FTIR spectra of PdNPs@Artemisia. The TEM image of PdNPs@Artemisia (Figure 4) shows that they are virtually spherical in structure and are approximately 20nm in diameter.The XRD pattern of PdNPs@Artemisiais was shown in Fig. 5. The intense peaks presented at 39.6, 46.1, and 67.8 deg. correspond to the (111), (200), and (220) Bragg reflection in Figure 5. 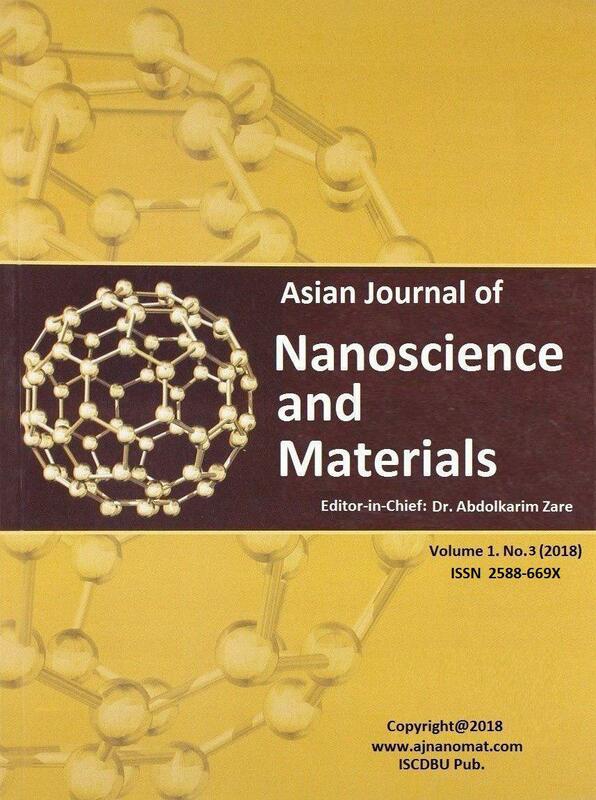 The XRD was additionally compared to the JCPDS standard (#05-0681) which verified the creation of palladium nanoparticles with cubic (fcc) crystal structure. In this sense, it is consistent with prior reports . Figure 6 shows the Energy Dispersion X-ray spectroscopy pattern that was recorded. 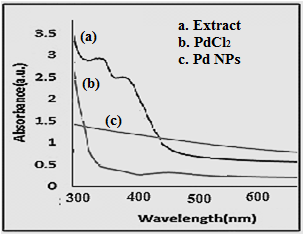 Characteristic peaks associated with palladium metal in ~3.7 were detected which further imply the successful procurement of palladium particles in the nanocomposite. Figure 4. TEM images of PdNPs@Artemisia. The morphology of the synthesized Pd NPs was studied by recording the SEM image of PdNPs@Artemisiacatalyst, which enumerated the formation of homogeneous and relative capping of Pd NPs by biomolecules of Artemisia abrotanum (Figure 7). The density and distribution of PdNPs@Artemisiaon the bifunctionalArtemisia abrotanum were studied via the respective quantitative energy dispersive X-ray spectroscopy (EDX) mapping. Elements C and Pd were found to be uniformly dispersed upon the entire surface of the collected PdNPs@Artemisia, rather than appearing solely on the edges, which signaled a homogeneous distribution of hydroxyl functional groups. Figure 5. The XRD patterns of PdNPs@Artemisia. Figure 6. EDX spectrum of PdNPs@Artemisia. Figure 7. SEMimages of PdNPs@Artemisiaand corresponding quantitative EDX element mapping of C and Pd. Reduction kinetics have a prominent effect in regulation of nucleation and the growth of nanoparticles. nF1OH extract from the Artemisia abrotanum were utilized as reducing and stabilizing agents for the synthesis of Pd NPs. Scheme 1 demonstrates that metal ions had been reduced to nano zero valent (NZV) metallic particles, employing flavonoid (F1OH) contents of the extract as ecological chemicals rather than the more frequently employed hydride reducing agent, sodium borohydride. Scheme 1. Reducing ability of antioxidant phenolics to produce Pd NPs where FlOH and NZV are flavonoid and nano zero valent, respectively. To further confirm applicability of the new catalyst (PdNPs@Artemisia), the Suzuki–Miyaura reaction was employed. Based on our previous experience with the Suzuki coupling reactions , we focused our initial investigation on the effect of various palladium amounts on the coupling reaction of phenyl boronic acid with 4-bromotoluene in the presence of K2CO3as a model reaction in aqueous ethanol (50%) at room temperature (Table 1). Results indicated that 0.1 mol% Pd at room temperature proceeds well and a 96% yield of corresponding biphenyl was obtained (Table 1, entry 3). It is worth mentioning that a similar reaction in the absence of Pd catalyst failed to proceed (Table 1, entry 5). aReaction conditions: 4-bromotoluene (1.0 mmol), phenylboronic acid (1.0 mmol), catalyst, K2CO3 (2 mmol) and EtOH-H2O (3 mL, 1:1) at room temperature. With the optimized reaction conditions in hand, we, next, investigated the substrate scope of a PdNPs@Artemisia-catalyzed Suzuki-Miyaura reaction. As summarized in Table 2, a range of aryl iodides and bromides, with phenyl boronic acid as the substrates, were converted into the corresponding products in high yields. The results indicated that aryl bromides and aryl iodides containing electron-withdrawing and electron-donating sections with a fitting progression of phenylboronic acid, and plentiful (high to excellent) yields of the equivalent coupling products were synthesized (Table 2, entries 1, 2, 4, 5, 7, 8). The aryl chlorides with a phenyl boronic acid coupling reaction needed extended reaction time as compared to bromides and aryl iodides. Moreover, it led to the production, in moderate yield, of the desired products (Table 2, entries 3, 6, 9). aReactions were carried out under aerobic conditions in 3 mL of H2O-EtOH (1:1), 1.0 mmol arylhalide,1.0 mmol phenylboronic acid and 2 mmol K2CO3 in the presence of PdNPs@Artemisia(6 mg, 0.1 mol%) at 25 ºC. Figure 8. Reusability of PdNPs@Artemisiafor Suzuki-Miyaura coupling reaction. Scheme 2. Possible mechanism of Suzuki coupling reaction. and utilizing bioactive Artemisia abrotanum extract enabled the formation of Pd NPs through the reduction of aqueous Pd2+ ions. Both polyols and carbonyl groups within the aqueous extract behaved as reducing and capping/stabilizing agents. Characterization of the procured Pd NPs was achieved via UV-vis, FT-IR, FESEM, EDX, XRD, and TEM studies. 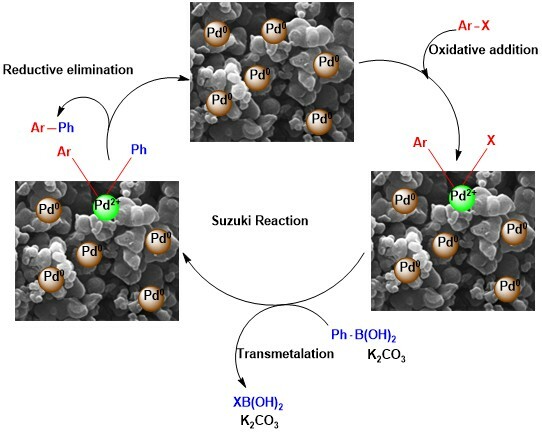 Looking at the production of biaryls in the Suzuki-Miyaura cross-coupling reaction at mild conditions proved the efficiency and stability of the heterogenousPdNPs@Artemisia catalyst. The reusability of the catalyst, achieved through centrifugation, along with negligible palladium leaching and the ability of the catalyst to be reused for multiple trials without any deduction in catalytic characteristics, is desirable and would further demonstratethe practicality. We are thankful to Payame Noor University, Pharmaceutical Sciences Branch, Sciences and Research Branch, Islamic Azad University, Tehran, Iran, for partial support of this work. Raveendran P, Fu J, &Wallen SL (2003) Journal of the American Chemical Society 125: 13940-13941. Varma RS, (2012) Current Opinion in Chemical Engineering 1: 123-128. Joerg G, Thomas B, Christof J &Mukesh M (2000) Medical Economics Company Montvale/ New Jersey 319. Veisi H, Ghorbani‐Vaghei R, Hemmati S, Aliani MH &Ozturk T (2015) Applied Organometallic Chemistry 29: 26-32. (e) Veisi H, Taheri S &Hemmati S (2016) Green Chemistry 18: 6337-6348.